ISG (induction strip galvannealing) improves quality and yield due to it's instant on-off capability plus its ability to uniformly control temperature. In addition it is adaptable to computer control and provides instantaneous response to changing line speeds. Metallugically it provides superior uniformity of zinc iron alloy, better paint adhesion, and excellent welding characteristics. Many existing galvanneal lines benefit from Ajax TOCCO heating systems. In fact, ATM supplied the very first induction heating system for galvanneal in 1986. 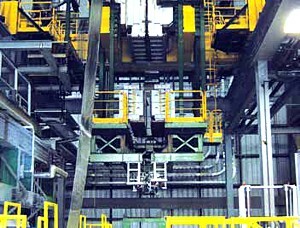 Heating for galvanneal has been successfully used in more than 50 lines worldwide. 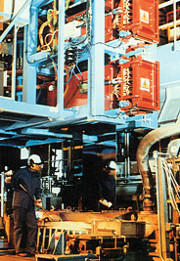 Galvanneal heating coils are very compact and utilize a unique design allowing them to move off the line to accommodate production schedules. Galvanneal using induction produces iron zinc alloy coating better than any gas fired furnace. Its precise temperature control and instantaneous response to strip speed assures uniform heating throughout the heating zone. Improves quality and yield due to its instant on-off capability, plus its ability to uniformly control temperature. 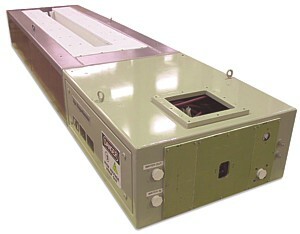 It is adaptable to computer control and provides instantaneous response to changing line speeds and conditions. Metallurgically, it provides superior uniformity of zinc iron alloy, better paint adhesion, and excellent welding characteristics.